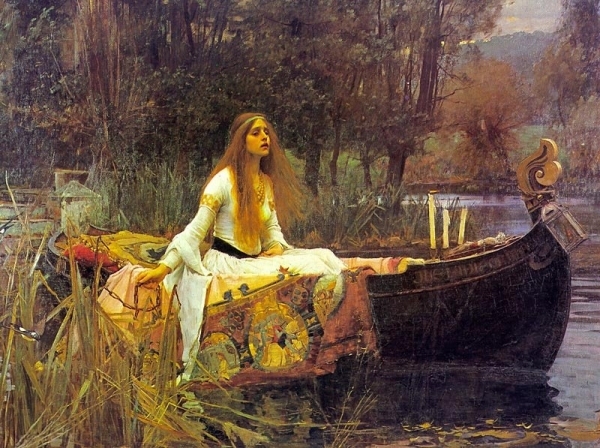 “Lady of Shalott,” oil on canvas, by John William Waterhouse, 1888. Times the size of her candescent body. With purpose, to keep the resilient out. Giving in not up, her soul she sells. Yet inside the buzz grows, she can’t repel. With hands bound her fire takes to the sky. and somehow the writing will get better. Your door was open and I imagined that you were sitting at your desk, waiting to hear my keys jangle as they bounced off my hip, hanging from my maroon and knotted lanyard. But of course you weren’t there, you wouldn’t leave hundreds of fingerprints on your glass table, you wouldn’t let the chairs sit ajar. I sat down at your table and I wrote. The words came, that was all that mattered. Then, for you, I pulled out those wet Clorox wipes, the ones that leave your hands feeling sticky, and make you go into that private bathroom to rinse them off. I erased the traces of intruders. I moved the chairs—careful to space them evenly between each other in their rows, line them up in columns. A table for your table. Ashley K. Warren is author of the chapbook Today’s Body. She also writes fiction and nonfiction and her work has appeared in various publications. A graduate of the Stonecoast MFA program, she has taught creative writing at Montana State University, Billings and in Billings public schools through the nonprofit organization Arts Without Boundaries.